Gentleman, let’s talk matcha. Whether you love the health benefits of this antioxidant boosting green wonder, or enjoy the earthy green flavor of this ubiquitous culinary ninja, iced matcha lattes are everywhere these days. You’ve most likely seen them at your local coffee houses, and although they are delicious, they are often made with tons of sugar and fillers (effectively negating any possible health benefits), and are uber expensive. Here in LA, a Grande Iced Matcha Latte with soy milk will set you back about $4.85. With my weekly matcha addiction, that comes out to over $250 annually! Of course, if you make it at home, not only can you control the flavor and quality but that you can also save a lot of $$$. Do the math, and a homemade latte comes in at 1/3rd of the cost (at around $1.59 per serving: matcha $0.66/tsp., soymilk $0.75/12 oz, vanilla syrup $0.18/oz.). This post contains affiliate links which means I will earn a commission if you purchase through those links, at no additional cost to you. 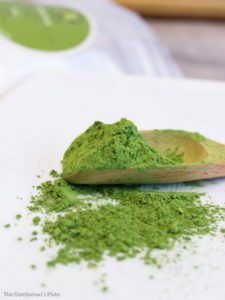 And thanks to Amazon, top quality matcha powder can be delivered straight to your door. 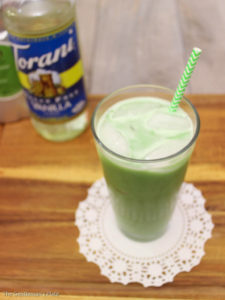 I also like my latte sweet, so I love using Torrani’s sugar-free vanilla syrup, which gives it a clean vanilla flavor. Personally, I love the creaminess of soymilk, but feel free to experiment with different milk alternatives (my wife loves it with a coconut-almond blend). And the process is super easy – add ingredients and shake. If you’re a real gentleman, a cocktail shaker comes in handy, otherwise a mason jar will do the trick. If you shake hard and long enough, all of the clumps should dissolve right in for a smooth velvety finish – otherwise, a strainer helps you catch any grit. Iced matcha latte for days, son! Quick and easy 3 ingredient latte, made with super healthy Matcha Powder and sugar free vanilla syrup. 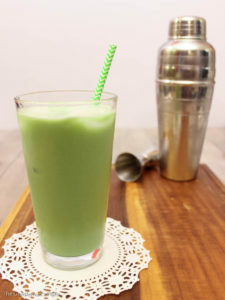 Place cold milk alternative in a cocktail shaker with ice, vanilla syrup, green tea and shake vigorously. Serve with a straw and additional ice as needed. Alternately, use a mason jar (or any type of jar) to shake all ingredients with if a cocktail shaker is not available. If clumps persist, feel free to strain the drink through a tea strainer before serving.